We Do Lines appeared in the September 2012 issue of Turf Magazine. The article illuminates the transition of We Do Lines CEO Chris Couri from the world of professional landscaping to the parking lot striping industry and franchising. The parking lot business, an industry with an estimated value of $29 billion, is very fragmented. However, it does offer growth potential for outdoor property management companies. The article talks about how the We Do Lines‘ management team seized on the untapped opportunity in parking lots, expanding their former landscaping company to include parking lot management and then eventually branching out into the successful, rapidly growing franchise it is today. Is parking lot striping the hot new revenue opportunity for landscapers? As the song goes: “They paved paradise and put in a parking lot” – and a new parking lot striping franchise is promising outdoor property management companies a new revenue stream. New England-based franchisor We Do Lines says landscape companies are positioned to deliver these services for their commercial and industrial clients.Some companies have already added the franchise to their operations.As of this writing in mid-summer, We Do Lines (WDL) had 12 franchise units across the United States, and it’s projecting 100 units over the next five years. With the parking lot striping industry being so fragmented, WDL also entertains the conversion of existing businesses.After having taken over and operated Young’s of Ridgefield, a commercial and residential landscape company, rental equipment and power equipment service center in Ridgefield, Conn., Chris Couri, CEO of We Do Lines, along with partners, Tom Darrow, company COO, and Dan Rella, CFO, sought an additional business opportunity to leverage their client databases, relationships and equipment.Couri and Rella were partners in 65-year-old Young’s of Ridgefield, with Darrow, who started Pennacle Landscaping in Ridgefield and operating Tedco Management Group LLC, Calabash, N.C., joining them to start and grow the We Do Lines business. The idea for WDL sprang from intense brainstorming sessions with Darrow, coming up with parking lot striping. This eventually led to related parking lot services. The company’s website (www.wedolines.com) lists curb painting and pavement stencils, handicapped spaces, wheel stops, traffic sign installations, warehouse floor striping and staging, and parking lot cleaning and light sweeping as services, as well. 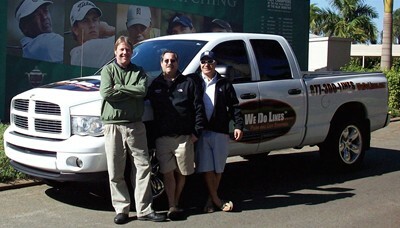 (L. to R.) Thomas E. Darrow, COO; Daniel Rella, CFO; and C. J. Couri, CEO, of We Do Lines were in the landscape business and came up with We Do Lines and the parking lot striping idea during a “brainstorming” session.